Surprised by what came in the mail, I couldn’t wait to get home to open the package. I was nervous, yet excited, and not quite sure of what I would find inside. Carefully, I lifted the lid, opening the box ever so gently. At first glance, my eyes observed a box full of gifts that exuded a sense of compassion and a feeling that its contents would provide that glimmer of hope and survival all bereaved parents long for. I saw a beautiful coin wrapped in a pink mesh laced bag, attached with a message of hope. Yes, this is the key to what loss is all about. Hope. “Helping is healing,” on the front side of the card and on the back a revealing and significant bible verse, 1 Peter 4:10. And yes, absolutely something I have found over the past years is that helping others really does aid in our healing. 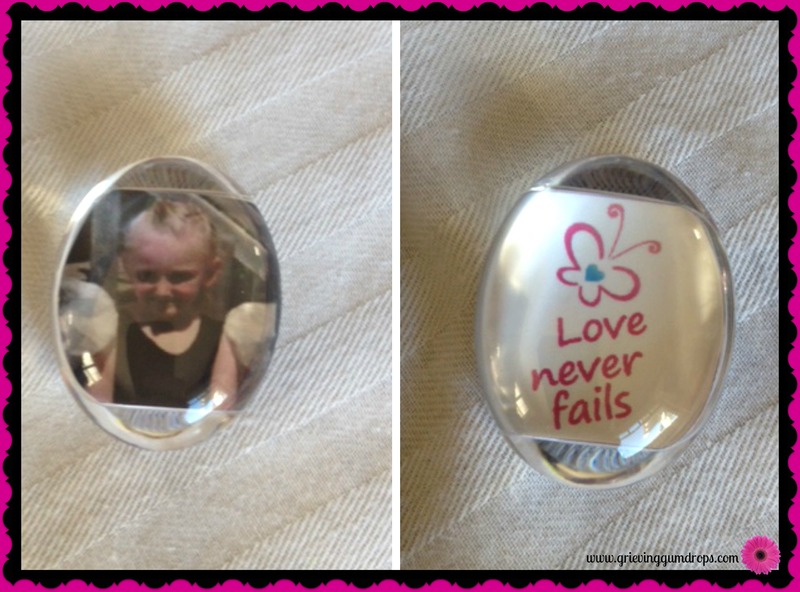 In addition, looking at me was a custom photo stone with Lydia’s picture on one side and on the back the saying, “Love Never Fails.” Perfect to carry in your pocket or lay on your desk, keeping your loved one close to your heart. Next, I saw a poem entitled “The Sailing Ship,” by Charles Henry Brent….and right beside, “In loving memory. Of Lydia Marie Greer” November 27, 2002- July 16, 2008– The poem struck a chord within me, making my grief known yet providing assurance that indeed, she is in Heaven surrounded by her loved ones. It’s still so hard to see that date, the day she passed. I hate seeing those numbers 7 and 16..together or separate. This is something that I just haven’t gotten used to. I still turn my head and cringe every time I see them, as they remind me of sad memories. However, on the flip side, what a wonderful gift… the acknowledgement of a beautiful life that lived and made an impact on so many. To me it was surreal.. It is definitely something to see your child’s name in print from, but as I experienced and lived in that moment, I realized it was about her, my daughter and me. She was here. I was 100% focused on her, her life and the deep love I felt for her still. And then, a little pink bag. As I looked inside, I was eager to see the gift that waited inside. I unwrapped the hot pink tissue paper revealing a magnificent necklace…one side with her photo, the other with a fitting quote. With tears flowing, I found myself talking to Lydia, telling her how much I loved and missed her…It was just what I needed.. Even after all this time the bond between mother and child remains ever so strong. At the bottom of the box was a pink journal along with writing prompts to encourage those healing words to come out onto the paper. Keeping a journal saved me. I was reluctant at first, as seeing my pain and words down on paper meant they were real. It was a bit frightening, but after years of writing, looking back and reading them now, they have been blessing in disguise, giving me understanding to the world in which I used to live. And it continued. I then found a plethora of literature to aid my healing and direct my faith, reaffirming my beliefs and correcting my doubts…Steps to Peace with God, Life After Loss booklet, When Tears Remain booklet, Heaven booklet, Our Daily Bread devotional, even beneficial for those who are unsure about where God is in their loss, but also provides much-needed comfort in our darkest hours, those hours when we doubt, can’t sleep, and struggle with how to survive. The contents of this box satisfied my soul touching the depths unknown to my existence. I can’t thank Ellie’s parents and their family enough for this life changing personalized gift they have given me. Priceless gifts from the heart. Just knowing that someone out there cares, remembers, and has put their time, heart and soul into a life of serving others in their time of need is absolutely remarkable and a true inspiration to others. 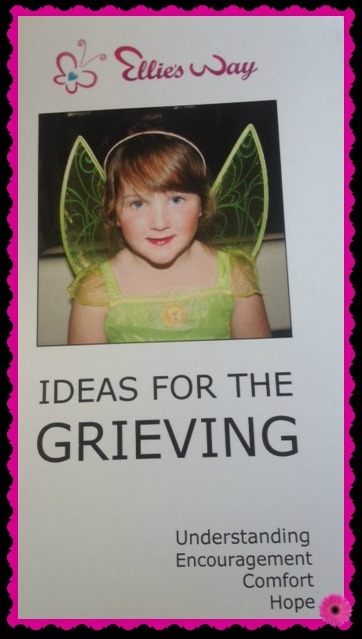 For me, I really enjoyed “Thoughts on Grief and Loss.” Each topic covered, 21 to be exact guide you through the feelings and thoughts that we as grieving parents all go through. From communication, grieving, forgiveness, feelings, love and so many more, there are tidbits of support and wise words to be heard. As if that wasn’t enough. I then see they are followed by bible passages which brings God’s healing straight to your heart allowing you to see things in a different light while embracing His presence. 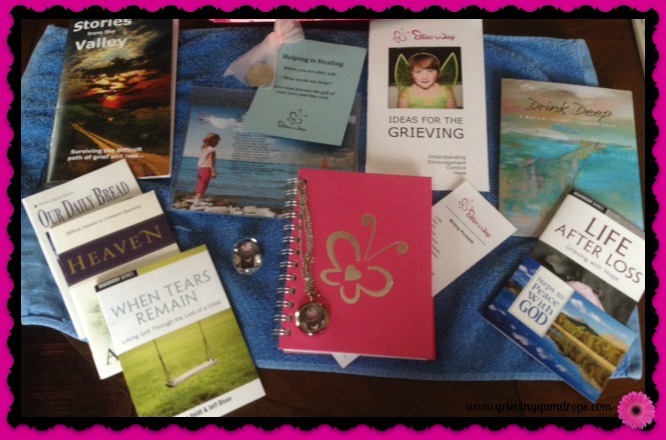 A Growing through Grief Audio CD was also there, which shares the effects of grief on us, emotionally, physically, mentally, socially, spiritually and more. A valuable resource for the broken-hearted. 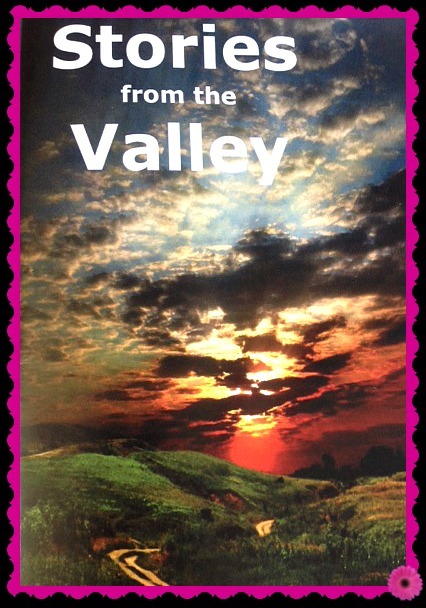 And finally, Stories From The Valley booklet, composed of 9 stories of parents and families who have endured such devastating losses, yet found ways to overcome and find healing through sharing their experiences and helping others, in which I am honored to be among the contributors. I just cannot stress enough the importance and meaning it can bring to connect with those around you who have experienced loss. Reading the enclosed booklet is essential. Hearing other stories even though painful at times, can bring a sense of calmness…they know…they get it…and they have survived. Their lives have made a beautiful transformation, blossoming from grief to hope. What an incredible movement God has made all because of this precious little girl named Ellie. As a result of her life, countless people are being comforted and given hope. Even though it has been six years since Lydia died, this box brought new life and meaning to me, reviving my passion for the life God is calling me to do, to share my experience and how He has impacted my life while helping to spread he word of hope, faith, and healing. The simple treasures of a little box bring joy and a revelation of the feeling that someone out there understands. Remember, you are not alone, and most importantly there is always hope. If you or someone you know has been affected by child loss, I strongly urge you to request a care package and openly receive the hope God has provided through Ellie. There are many ways to support Ellie’s Way, through social media sharing, volunteering, or simply sponsoring a care package. Visit www.Elliesway.org to request a care package and support this life changing cause. To My Son On His Birthday…. People avoid doing things out of fear that they will upset the parents. I did a “care package” of sorts when my nephew passed at age 19. While at his funeral I took photos of everything — the flower arrangements, quilts made in his honor, the signatures everyone had written on his casket, a painting made in his honor, the displays that my sister had put together, and even a close-up of his hands in the casket where there were two baseballs, one of which had been signed by all the members of one of the teams he played on. What I did is put together a Shutterfly book and I mailed it to my sister and brother-in-law a year later. It arrived on the first anniversary of his passing. My sister said it is one of her “top 10” gifts and although it brought back sad memories it preserved things about his funeral she did not have otherwise preserved or did not realize — such as the signed baseball. I am glad the gift box brought you joy, but people should realize anything that says you remember and honor the memory of their child is acceptable. Grace, what a wonderful thing you did at your nephew’s memorial. Priceless gifts that mean so much. And yes, you’re right, anything that says you remember is absolutely perfect. 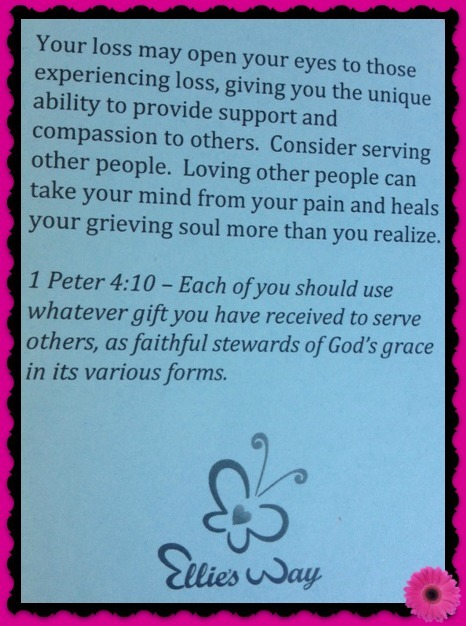 Thanks for sharing..
What a wonderful way to help others who have felt the fire of grief. I need to know how do I get a care pkg? I am having a awful time dealing with my granddaughter Brooklyn passing . she will be gone 3 yrs on July 12th . Hi Michelle, you can go to http://www.elliesway.org and sign up for a personalized care package. They really are wonderful for a grieving soul. I am so sorry to hear about your sweet Brooklyn.Ellie’s way is a fantastic organization with lots of helpful resources. Surround yourself with those who know the journey. May He give you comfort and strength to endure this new life. Your care packages are so comforting. Thank you so.much.